Rifle offerings in .33 caliber have been around for more than a century, dating back to the .33 WCF from the early 1900s, but it wasn't until Winchester launched the .338 Win. Mag. in 1958 that this family of cartridges really gained a footing among American hunters. Based on a shortened .375 H&H case and capable of fitting into standard-length actions, the .338 Win. Mag. generates close to 4,000 ft.-lbs. of energy and shoots flat enough to be considered a genuine long-range hunting cartridge for tough game like elk and moose. It has also earned a spot as one of the top cartridges for hunting the great bears, and aside from dangerous African game, it is capable of taking any animal anywhere on the planet. It was—and is—the prototypical offspring of the belted magnum craze of the mid-20th century and remains a versatile choice for those who can stand the recoil this powerful cartridge generates. Handloaders had been toying with milder wildcat .338s for years when, in 2006, the .338 Federal became SAAMI standardized. This cartridge is based on a necked-up .308 Win., and factory loads are available from 180 to 210 grains. Handloaders have the option of using heavier 225- and 250-grain bullets as well. Since its inception a decade ago, Savage, Kimber, Sako, Montana Rifle Company and other manufacturers have been producing .338 Federal bolt guns, and it can be had in the AR platform as well. These two cartridges share the same bullet diameter, but they differ substantially in performance. Since it is based on the .308 Win. 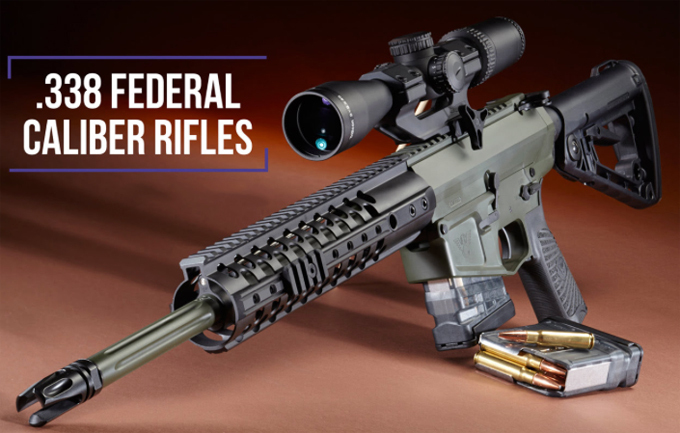 the .338 Federal fitsin short-action rifles. Brass is affordable and widely available. But there are more .338 Win. Mag. factory rifles available today, and virtually every bolt gun manufacturer offers at least one .338 Win. Mag. In terms of ballistics, the larger .338 Win. Mag. offers a decided advantage. Federal's 200-grain Trophy Bonded Tip ammo leaves the barrel at 2,930 fps, fully 300 fpsfaster than the same bullet from a .338 Federal. Zeroed at 200 yards, the .338 Win. Mag. drops 7.1 inches at 300 yards, 20.7 at 400. The .338 Federal is 9.2 inches low at 300 yards and 26.3 inches low at 400 when zeroed at the same distance with the same 200-grain bullet. The Win. Mag. also packs a lot more punch. At 400 yards the load is carrying 2,027 ft.-lbs. of energy while the Federal drops to 1,581, and that can make a difference on large, tough game. But the .338 Win. Mag. 's impressive ballistics come at a price. The .338 Win. Mag. rifles are typically about a pound heavier than .338 Federal rifles, and recoil from the magnum is, on average, 50 percent greater. And then there's the cost factor. The Federal case has a water capacity of 44.5 grains of water. Compare that to the .338 Win. Mag. 's cavernous 76.8-grain capacity. That's a 75 percent increase and a lot more powder to buy. Factory ammo is more expensive as well: Comparing the 200-grain loads referenced above, you'll pay about $39 per box for the Federal round and about $57 for the magnum. The decision ultimately comes down to how much you are willing to spend on ammo, how much recoil you can effectively handle and the type of game you will be pursuing. If you want a deer-caliber cartridge that will work on elk and moose at moderate ranges the .338 Federal will do the trick. After all, accepting the standard that it takes 2,000 ft.-lbs. of energy to cleanly kill an elk, the .338 Federal is capable of doing so out to nearly 300 yards. If you're planning on hunting big game at long range, big bears at any range or the full breadth of African plains game, the .338 Win. Mag. is the better—albeit more expensive—alternative.